Carsten Holler’s mid-career retrospective exhibition Experience is an immersive assault on the senses; a confusing, exhilarating, intriguing, and occasionally nauseating series of interactive installations choreographed over four floors of The New Museum of Contemporary Art. Whilst being his largest mid-career retrospective in the US to date, the selection of works exhibited remains focused, comprising a mixture of Holler’s signature crowd pleasing sculptural installations as well as smaller experimental objects, films and participatory interventions. The entire infrastructure of The New Museum building is incorporated into the presentation of each of Holler’s works. In the ground floor Lobby an entire wall is plastered in ZÃ¶llner Stripes, a hypnotic monochrome pattern of diagonal zipper lines designed by Holler to create trippy optical illusions, and used here across the exhibition entrance. Functioning as a visual precursor to Experience, Holler’s ZÃ¶llner Stripes hint towards other psychedelic encounters in store for visitors to the exhibition. However, general access to his major centrepiece ‘attractions’ is disappointingly limited. Visitors wanting to ride the more hazardous works on show, from the helter-skelter Untitled (Slide), to the Mirror Carousel and Giant Psycho Tank are requested to sign a series of waiver forms first. Standing in line for almost thirty minutes before I’ve even entered the exhibition, I am reminded of the enormous queues for Tate Modern’s Turbine Hall installation by Holler, and wonder whether my frustration at playing a part in this initial waiting game is part of the whole Experience. In exchange for signing away my liability I receive a red wristband, granting me free reign across the building. The temporary loan of my bankcard also places a pair of Holler’s futuristic Upside Down Goggles in my hands, essentially an over-designed contraption engineered to radically invert the viewer’s visual perception of their surroundings. The visual distortion produced by this elaborate device is the result of a simple intervention, achieved via a pair of angled mirrors positioned below eye level inside the metal casing. Despite their complex appearance, Holler’s Upside Down Goggles are conceptually elegant, creating a simple intervention into the field of vision, which in turn elicits a series of totally disorientating embodied affects. With the goggles on my sense of balance and spatial awareness is soon significantly altered, leaving me to navigate towards the room of Giant Triple Mushrooms one wobbly legs. 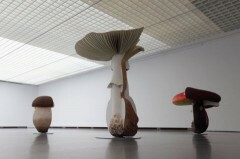 In the Lobby Gallery a trilogy of oversized fungi, rendered in a Technicolor palette, ascend in scale across the polished floor. Larger than life and spliced in half, they are monstrous objects, made even stranger when viewed through the nauseating Upside Down Goggles. The thematic connection between these psychedelic painted mushrooms – reminiscent of the opium-induced imagery from Alice In Wonderland – and the hallucinatory perspective brought on by Holler’s modified goggles is a fairly obvious, with both works alluding to ways in which states of perception can be altered via psycho-physical interventions. Moving upstairs, Holler continues to commandeer visitor experience by incorporating even the most transient spaces of the gallery into the exhibition. In The New Museum elevators two flat screen televisions are installed on opposite metal walls depicting two female twins in each monitor, seemingly repeating “I say everything you say” to each other. As the elevator ascends I observe fellow visitors watching these screens. Laughing to themselves and each other, some are wearing Upside Down Goggles, others not. Boxed in a metal room, it seems the boundaries of normative gallery behaviour are beginning to blur as slippages between the gallery fixtures, artworks and spectating viewers begin to emerge. 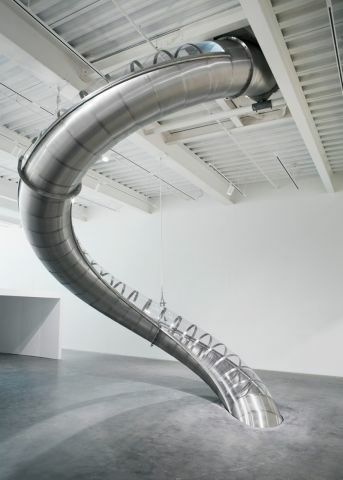 The open mouth of Holler’s descending helter-skelter Untitled (Slide) greets me on the fourth floor, a brushed steel structure which traverses down two gallery levels, physically intersecting the two concrete floors below to spit you out onto a bed of foam mats. Surveying the queue for the slide snaking around the room, I decide instead to hop on Holler’s imperceptibly slow yet dazzling Mirror Carousel. Emerging in the early 1990’s, the emphasis on participation in his work has led Holler to be readily characterised as an artist of the Relational Aesthetics era. Yet as a complicit participant, or activator of his work here, other uncomfortable, subjective affects beyond the social seem to become apparent, at least for me in The New Museum. 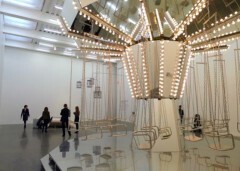 Sitting on the barely-moving metal swings in front of a waiting audience provokes a sudden sense of self-consciousness in myself, arguably an intentional response, as Holler’s work is as much about making visible the role of the spectator as the sensorial experiences produced by activate participants in these experiential installations. To perceive Holler’s works, from both inside and out, opens up the possibility of both the spectating and participating viewer becoming mutually activating agents within the artwork itself. Across from the Mirror Carousel caged birds chirp from their perches in Singing Canaries Mobile, a Calder-esque kinetic structure suspend from the ceiling. The sculpture is designed to move freely as canaries fly within their cages, but today the birds seem to be staying put. With the queue not yet diminished, I descend a flight of stairs to the third floor, past the surreally automated Pill Clock dispenser and detailed framed pencil drawing of potential Skyscraper Slide Connections. Less monumental works populate these lower floors, such as High Rise Sculpture, a Perspex tower block maquette interconnected with Holler’s slides, and a series of one-on-one sensory works in the Experience Corridor on the floor below. Although relatively modest in scale, these smaller interventions add depth to the exhibition, functioning as visual sketches for ideas in the making, or small visions of bigger installations made present here. An element of playfulness is also retained, as in Holler’s Infrared Room in which visitors view their movement on a screen using time-delay video projection, or in Holler’s Willy-Wonka style sniffable vial of a noxious Love Drug, installed in the Lab Rat testing space of the Experience Corridor. On this occasion the gravity defying Giant Psycho Tank is out of order, which comes as a relief as the thought of having to strip down to my birthday suit in the middle of a gallery in December isn’t so appealing. Instead I race upstairs to give the slide another go. Appearances are deceiving, as what I anticipated to be a gentle playground ride is more of a hair-raising descent at high speed, ungraciously throwing me onto a floor of padded crash mats at the end. As I make my way downstairs it seems this final work provides a suitable analogy for the whole exhibition, sharply highlighting the rattling difference between perception and experience Holler’s work seeks to expose, immersing the viewer completely within the realm of the art object to produce entirely new kinds of aesthetic experience.